Thank you for visiting ChildAutism.org.uk. Please read these terms and conditions carefully before using this site. For online payment refund policy click here. These Terms apply to the entire contents of this Child Autism website, to any downloaded or streamed content and to any correspondence by e-mail between us and you. The Privacy Statement for Child Autism UK below also forms part of these Terms and Conditions (together referred to as ‘Terms’) and should be read also. Access and use of this website is provided by Child Autism UK, a registered charity no. 1063982 (in England and Wales) and a company limited by guarantee registered no. 03300043, whose registered at: 3 -5 Forest House, Horndean Road, Bracknell, Berkshire. RG12 0XQ. References in these Terms to ‘we’ or ‘us’ are to Child Autism UK. 2.1. Child Autism UK may change these Terms at any time, in which case the amended Terms will be posted on the website and will apply from the date we post them. Please check these Terms on each occasion you use the website. If you continue to use the website you will be bound by the latest Terms. 5.1. All content posted or submitted by users of the website, including but not limited to, stories, comments, suggestions and emails (‘Contributions’) must comply with the following plus our Contribution Rules set out below. Please read these rules carefully before registering as a contributor or submitting any material to this website. If you register as a contributor the Contribution Rules will form part of the contract between you and us. Contribution rules apply equally to members of Child Autism UK and other persons and also to member areas of the site as well as open access areas. 5.2. We are not responsible for Contributions posted to our website. These Contributions express the views of the author of the Contribution, not the views of Child Autism UK. 5.3. If you have a complaint about any content on this website please contact us immediately by emailing info@childautism.org.uk. To consider your complaint we need your name, company name if relevant, contact details (land address, telephone number and email), details of the exact content complained of and details of why you are complaining about that content. Please note that no action can be taken without this information. 5.6. You agree to indemnify, defend, and hold harmless Child Autism UK and its trustees, directors, officers and employees, from and against all liabilities, claims, demands and expenses arising out of any of your Contributions which breach these Terms. 6.1. If you want to make use of certain facilities available through our websites or to carry out certain actions (such as registering to obtain a newsletter, receiving/streaming regular pod casts or audio content, ordering a product or contributing comments to a discussion website) you may be required to register with us. During registration, you will be asked to provide an individual user name and password which you will need to use each time you carry out the action which you registered for (eg each time you purchase a product or submit a Contribution). We may change your user name and password from time to time. We take your privacy very seriously and will treat all of your personal information in accordance with all applicable data protection laws in England and Wales. Please read our Privacy Statement for Child Autism UK. 8.1. You acknowledge that all copyright, trade marks and other intellectual property rights in the website and all photographs, designs, images, text, software, data, audio, video, files and other material in the website or material generated by or transmitted from the website (“Child Autism UK Material”) are owned by us or our licensors. You are permitted to use the website and Child Autism UK Material only as expressly authorised by us. 8.2.3. any Extract is retained, printed and/or copied entirely and is not used in a derogatory or misleading context and in particular may not be used for the purpose of promoting, advertising, endorsing or implying a connection with you (or any third party) and Child Autism UK, its agents or employees. 8.3.3. perform, broadcast or otherwise transmit, post, share or make available to the public any Child Autism UK Material. 8.6. 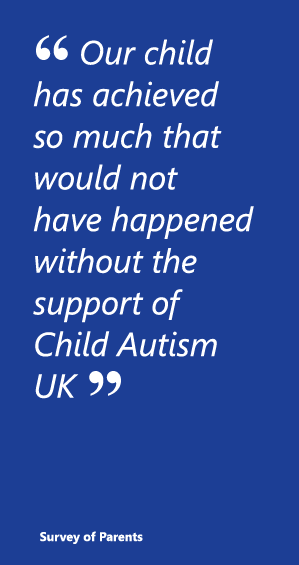 Whilst we encourage our supporters to campaign on the issues referred to on our websites, please do not imply that you are taking action on behalf of Child Autism UK and in particular do not state that Child Autism UK is taking, or proposes or is considering taking, action against individuals or organisations. 9.1. Child Autism UK may from time to time allow companies to advertise goods and services on our websites. While Child Autism UK will not knowingly display an advert that is untrue, or which relates to goods or services contrary to our objects, the display of an advert does not mean that we endorse the advertiser’s goods or services. Child Autism UK is not responsible for the accuracy of any advertising material or for any advertised product or service. 10.5 Nothing in this disclaimer applies to any products which you purchase directly from Child Autism UK. Where links are provided to products on a third party website, Child Autism UK cannot ensure that purchasers will be satisfied with any products or services that are bought from that third-party website and any complaints about the performance or otherwise of the product should be taken up with the manufacturer or retailer direct. Except for products expressly sold by Child Autism UK, the inclusion of a company’s product on a Child Autism UK website does not represent any endorsement or warranty of that product by Child Autism UK. 10.6 Child Autism UK does not make any representations or warranties as to the security of any information (including, without limitation, credit or debit card and other personal information) that purchasers might be requested to give to any third-party, and purchasers hereby irrevocably waive any claim against Child Autism UK with respect to such websites and third-party content. Child Autism UK strongly recommends you to make whatever investigations are necessary or appropriate before proceeding with any online or offline transaction with any third party. Child Autism UK will not be liable to you for any delay in delivering any services or order or breach of our obligations, if the delay or breach is due to acts of God, civil commotion, riots, malicious damage, floods, drought, fire, legislation, failure of ISP or telecommunications provider or other cause beyond our reasonable control. This does not affect your statutory rights. This document was last updated February 2011. You have the right to cancel any training course booking within seven days of making the booking; You have the right to cancel any membership application within seven days of making the application. Customers cancelling will have their payment refunded in full within seven days of Child Autism UK receiving the cancellation. If participants in training courses are unable to attend through illness or bereavement and are unable to cancel the booking within the agreed period the course may be re-arranged or a credit or refund may be issued. No refunds will be made on training course bookings made within seven days of the scheduled course date. Payments of invoices issued by Child Autism UK made through this web site are not refundable. Child Autism UK are committed to protecting and respecting your privacy. Our Data Protection Officer is Mandy Williams; any questions regarding our privacy practices should be sent to her by email to info@childautism.org.uk or phoning 01344 882248. The personal information we collect might include your name, address, email address, IP address, and information regarding what pages are accessed and when. If you make a donation online or pay for services, your card information is not held by us, it is collected by our third party payment processors, who specialise in the secure online capture and processing of credit/debit card transactions. We may pass your information to our third party service providers, agents subcontractors and other associated organisations for the purposes of completing tasks and providing services to you on our behalf (for example to process donations and send you mailings). However, when we use third party service providers, we disclose only the personal information that is necessary to deliver the service and we have a contract in place that requires them to keep your information secure and not to use it for their own direct marketing purposes. Please be reassured that we will not release your information to third parties beyond the Child Autism UK for them to use for their own direct marketing purposes, unless you have requested us to do so, or we are required to do so by law, for example, by a court order or for the purposes of prevention of fraud or other crime. You have a choice about whether or not you wish to receive information from us. If you do not want to receive direct marketing communications from us about the vital work we do for children with autism and our services, then you can select your choices by ticking the relevant boxes situated on the form on which we collect your information. We will not contact you for marketing purposes by email, phone or text message unless you have given your prior consent. We will not contact you for marketing purposes by post if you have indicated that you do not wish to be contacted. You can change your marketing preferences at any time by contacting us by email: info@childautism.org.uk or telephone on 013344 882248. The accuracy of your information is important to us. We’re working on ways to make it easier for you to review and correct the information that we hold about you. In the meantime, if you change email address, or any of the other information we hold is inaccurate or out of date, please email us at: info@childautism.org.uk, or telephone on 013344 882248. You have the right to ask for a copy of the information Child Autism UK hold about you. It is part of the mission of Child Autism UK to provide services for children. Information about children, including their personal information is stored on our database. Such information is normally supplied by the child’s parent(s) or legal guardian(s). It is not the policy of Child Autism UK to contact children under the age of 18 directly. Our web site may also use the SessionCam web site recording service. SessionCam is a product that has been developed by ServiceTick Ltd. SessionCam may record mouse clicks, mouse movements, page scrolling and any text keyed into website forms. The information collected does not include bank details or any sensitive personal data. Data collected by SessionCam from the ServiceTick website is for Child Autism UK internal use only. The information collected is used to improve our website usability and is stored and used for aggregated and statistical reporting. We may make changes to this Privacy Statement from time to time and changes will be posted on this page. If the change in our Privacy Statement affects the use of your personal information we will do our best to contact you to seek your consent to the change in use. By using our sites, or by entering a competition, you consent to the collection and use of information by Child Autism UK in accordance with our Privacy Statement. If you do not agree to this, please do not use our sites or enter our competitions. Any personal information submitted via our websites or by text is treated in accordance with the General Data Protection Regulation. To find out more about your entitlements under this legislation, visit the Information Commissioner’s website. If you would like to review or revise information you have previously provided to us online, you may do so by emailing info@childautism.org.uk. Please click to read our Privacy Statement for Clients here. Please click to read our Privacy Statement for Funders here. Please click to read our Privacy Statement for Members here.